Morticia and Gomez as found – Photo: Angela Davies Ward on Facebook. 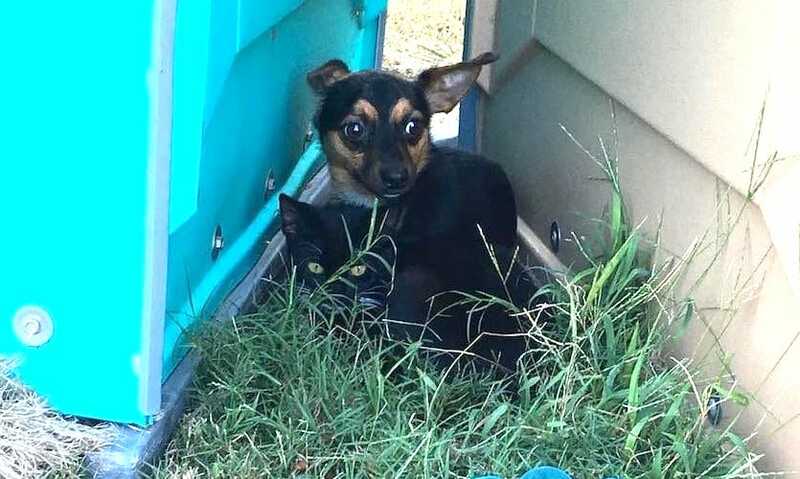 A dog, a Chihuahua-mix, and a black-and-white cat were seen huddled together between portable toilets at a park in Hampton, Virginia, USA. They must have been abandoned because they were there, as you can see in the photograph, frightened and alone. 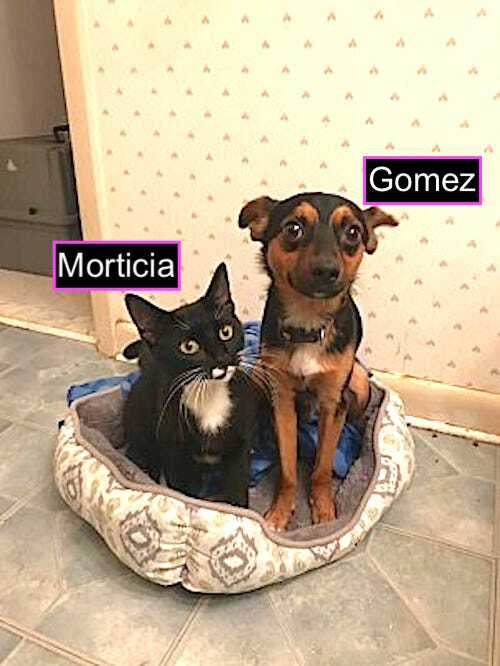 The dog whose been named Gomez, was protective of his best feline friend, Morticia. Morticia and Gomez. Photo: Saver of Souls Pet Rescue. When somebody got too close Gomez began growling, protecting himself and his companion. Clearly they needed help and thankfully a nice passerby did just that. Animal Control were notified and this sweet couple were taken to a shelter. At the shelter they were kept apart because that is the protocol. Sadly no one came forward to claim them but perhaps it was good fortune. Safety regulations kept them apart which also meant that they were likely to be adopted separately and be apart for the remainder of their lives. Another rescue organisation, Savour All Souls Pet Rescue, stepped in. The director of this animal rescue organisation, Turkan Ertugrul, noticed a photo of them on Facebook and decided to take action. The rescue made an effort to keep them together as you can see from the video below. I’m told that Morticia is 10-months-of-age and Gomez is two. The pair are now being looked after at a foster home where as far as I know they are awaiting an adopter. They will be re-homed together. The video is charming because they are so clearly best buddies. Their lives are enhanced immeasurably by their friendship. It would have been very sad if they had to be separated. It is one of those examples, of which there are quite a few, where an adopter, at an animal rescue, must be made to take on the responsibility of adopting two animals together. It should be easy to convince a person to do this because their lives will also be much better and easier. It takes some of the responsibility away from a companion animal owner when a pair of animals entertain themselves and make each other content by their presence. The story first appeared on The Dodo as far as I am aware. This entry was posted in Animal Rescue and tagged animal rescue, dog and cat, dog and cat in love with each other by Michael Broad. Bookmark the permalink. Absolutely bonded and adopting them out separately should have never been an option. How cute!! I’m glad they kept them together. Me too. It was essential.